Kubbitji Kngwarreye, like many Utopia artists, was initially employed as a stockman, and began painting in the early 1980s. As Custodian of his country on the northern boundary of the Utopia Homelands, Kubbitji painted interpretations of the Emu Dreaming sites and the ceremonies associated with Men’s Business (Initiation Ceremonies) and Ancestral Dreamings, using precise dots, and featuring meticulously painted circles of dots on a chequered or dotted background. 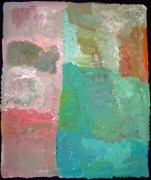 About the year 2000, Kubbitji\'s work became far looser and more \'abstract\', and his work was then likened to his sister Emily Kame Kngwarreye’s final works, with wide brush strokes.